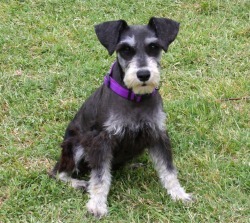 Mitzi is a black and silver AKC Mini Schnauzer girl who weighs 11.5 pounds. She is very gentle, devoted and well-mannered. She loves to be held and have her chin rubbed. She is one of our quietest dogs, rarely making a sound. She makes a wonderful, attentive mom who takes very gentle care of her puppies.